Although I have covered these points at length, attempting to correct some major misconceptions, most of this study is straightforward and simple. Many of the concepts are already understood and widely taught but as bit pieces rather than as the coherent whole so, as I see it, they are not sufficiently applied. For example, everyone ‘knows’ that the greatest in the kingdom of God are to be servants, and many in the church are indeed servants and great in God’s sight, yet much in our church structures actively denies and militates against that. Even our words reveal the conflict. If leaders are to be servants in any more than name only, how can we have even considered describing their work in terms such as ‘ruling’ or ‘exercising authority’? These contradict the whole concept and meaning of servanthood. Something has to give way when these opposing thoughts are entertained and since we are much more familiar with the world in which we live, as well as much more easily tempted by power, it is the servant who goes and the king who remains. (i) All leadership is defined and limited by ‘the way’. Any leader who seeks to lead outside of the way at that moment forfeits his right to be followed. Accordingly all leaders must always be willing to have their lead examined and corrected by anyone, even a child or a donkey, if it is wrong. (ii) Leaders are explicitly commanded by Jesus to reject the way the world’s leaders function; they are not to lead as lords but as servants. They are not to exercise authority over the people of God, authority being defined as ‘the right to enforce obedience’, since there is only one Lord in His kingdom and ‘the government is on His shoulders’. He has and retains all authority in heaven and on earth. (iii) When Israel asked for a king, on top of the five other kinds of leadership God had already given them, they went too far and rejected God from being their king. Although He granted their request, He left them to suffer the natural consequences. We, the people of God today whether Jew or Gentile, are often repeating this mistake and suffering the spiritual consequences. (iv) The apparent benefits of having a central, visible, authority figure, copying the natural order, not having to make hard decisions nor fight the battles, exist only in the natural realm and are all directly counter-productive to the ways and eternal purpose of God. The individual spirituality, growth, and transformation of all the saints are directly caused by God alone being our spiritual King and Father. (v) The natural order has its temptations but we also have an enemy who is always seeking to replace Christ by the spirit of antichrist. We can actively help Satan, as Peter did, simply by setting our minds on the natural order rather on the will and kingdom of God. (vii) Leaders are to lead the saints in exactly the same way as believers are to lead unbelievers to faith, that is, by being witnesses to the truth, by persuasion, by being examples, and by being servants. This necessarily excludes being lords, coercion, and exercising authority over them. (viii) This does not mean leaders are to become weaklings – look at Jesus cleansing the Temple, or John the Baptist confronting Herod and Herodias, or Stephen confronting the Sanhedrin, or Paul and Silas confronting the unjust magistrates in Philippi, or Peter addressing Ananias and Sapphira. (x) The people of God are to be treated at all times in a manner worthy of their calling as kings and priests. Our leadership and structures, even the language and labels we apply, should be corrected until they are consistent with the eternal purpose of God. 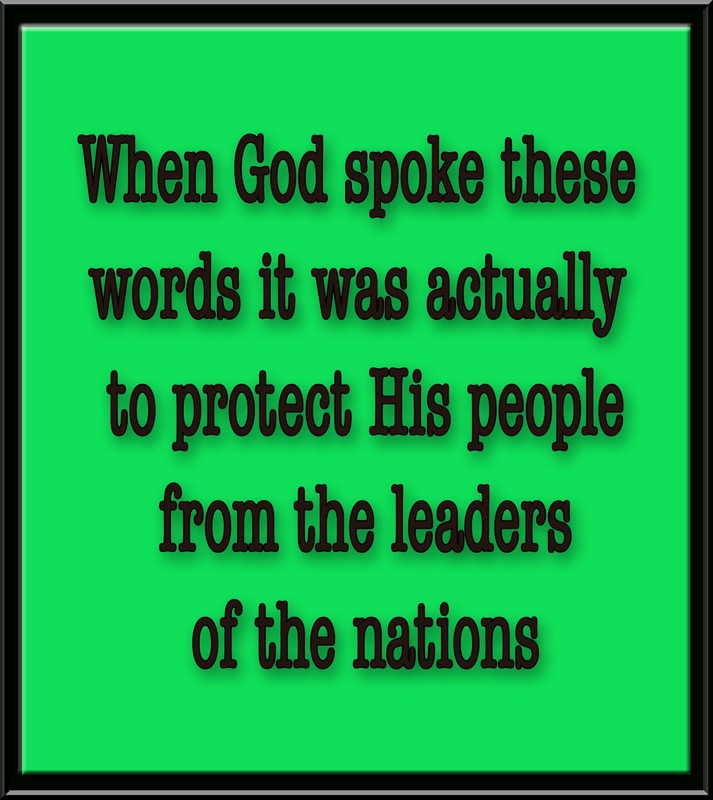 As leaders in the Kingdom, therefore, we must lead His ‘holy nation’ in a way that is utterly different to the way of the leaders of the nations, as God commands, lest we leaders touch His anointed ones and harm those through whom He wants to speak to reach the whole world. It may well be that we as leaders are needing to repent of our unbelief in holding to a low view of the people of God and a high view of ourselves.